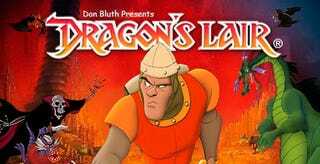 Don Bluth is Trying to Make a Dragon's Lair Movie, You Guys! Land Before Time, All Dog’s Go to Heaven, Thumblina. Between the late 80s and the early 2000s, animator Don Bluth gave Disney a run for their money with a series of animated adventures that were just as classic as anything from the House of Mouse. After the financial failure of his final movie, Titan A.E, Don Bluth retired but is trying to come out of retirement to bring back one last hooray: a 2D animated movie based off of his arcade classic, Dragon’s Lair. Dragon’s Lair was not only stunning to look at, it was an experimental and innovative game that pushed the limits of what arcade machines could do by combining gameplay with prerecorded animated scenes that were accessed from a laser disk. With games like Persona, Professor Layton and many JRPGs we take this combination of animation and fluid gameplay for granted, but in the 80s when the game came out, it was leaps and bounds ahead of its time. Though the original Dragon’s Lair has been rereleased numerous times across various platforms, this movie adaptation marks not only a chance to change the face of game-based movies, since the original character designer and animator behind the franchise is helming the project, but also a strike back for 2D animation, a genre that has largely fallen on the wayside in the US as Pixar-esque CGI pictures take up the majority of the animated landscape. However, this movie can’t happen without the public’s support. So check out Don Bluth’s Kickstarter and support an animation legend as well as a classic game!